A few musings on totalitarianism, brought on by a work-related visit to Vietnam. I have juxtaposed this with a recent re-reading of Orwell’s “1984”. I read a lot of books at once, mind, and I am also ploughing my way through a collection called “From the Gulag to the Killing Fields: Personal Accounts of Political Violence and Repression in Communist States”. It has been put together by an academic called Paul Hollander, himself a victim of the political violence of the Hungarian uprising of 1956. It’s certainly not bedtime reading. It makes uncomfortable reading for me, much less for anyone with remotely left-wing sensibilities. We tend to look at Russia and China as the worst offenders in terms of the sheer volume and quantity of communist political oppression and violence, and this book tends to support that view. But reading books these upsetting personal stories, other places take the record for sheer horror and human tragedy (Cambodia and Vietnam). For the ill-treatment of political prisoners, I’d look at Cuba, where there was a peculiar and toxic mixture of Latin machismo and the malevolent foolishness of Marxism. It never fails to be a pleasant surprise to me that books like this collection are in print in the UK at all. It is not beyond the bounds of darkest fantasy that a time will come for the UK when having a copy of such a book could put someone at risk of being sent to prison. It’s always good to pick up a few points from Orwell. His character “Bernstein” who ostensibly writes the “book within the book” plot device allowing Orwell to lecture us on totalitarianism, says that the rise of machines has, “by producing wealth which is sometimes impossible not to distribute“, leads to an increase in average living standards. Our standard of living has indeed improved from the early 20th century (earlier really) until now, and should continue to improve all this century. This is not politics, nor economics, but technology – the rise of machines. Orwell notes that “an all-round increase in wealth threatens a hierarchical society” and “A hierarchical society is only possible on the basis of poverty and ignorance“. Amen. This truth lies at the very heart of “1984”, and at the heart of opposition to technology for it’s own sake. Opposition to “machines taking over men’s jobs” is at heart a desire for order and hierarchy, a vote for the established order, an endorsement of the status quo. And I believe the status quo is almost invariably worth upsetting. Technology and machines, of themselves, create wealth and hence threaten the status quo in hierarchical societies. We live in times of extraordinary complexity. Perhaps it was ever thus: were there ever truly simple and straightforward times? Yet, our willingness and our ability to discern complexity is under attack as never before. It is under attack from social media; it is under attack from the rise in sentimentality we’ve seen over this last twenty years or so, and it is under attack because of the fashion for hyperbole and over-statement. The deplorable rise of “spin” – the use of language to conceal, obscure or divert people from the facts – has much to answer for. The use of carefully chosen, politically charged, and nuanced phrasing, has, paradoxically, eroded our capability to discern nuance. We look back at events like the Great War, and perhaps see simple causes, straightforward effects, obvious and clear protagonists and antagonists. We view such events through the simple lens of modern thinking. Cliches such as “senseless slaughter” come to our lips; we take off our hats, and rightly, spend a moment in silence to remember the fallen. But it was never that simple: that war was no simple struggle between good and evil, nor even a titanic battle between two great empires, the British and the Austro-Hungarian. Britain, even the British Empire, was part of an alliance, and not even the senior partner at that. And then, consider what else was happening at the same time as the Great War. The struggle for female emancipation and women’s suffrage. The Easter Rising and the struggle for independence in Ireland. The Russian revolution. The technical innovation happening as a result of the war; the changing relationship between the New World and the Old. All of it points to a time of complexity to which we don’t do justice by over-simplifying what happened. It is not less true today. I’m minded to reflect on our shortening attention span. My boss wants 3-5 bullet points, size 21 font, one slide in Microsoft PowerPoint – just the salient facts to present to the Board. In the second war, Churchill reputedly turned to his underlings and asked them to provide for him a “report on the current state of the Royal Navy – on one side of a sheet of paper”. As writers we do have a duty to keep things simple, to use short words, sentences and paragraphs, and to cut out unnecessary waffle. There is a case for simplicity – but we have made the case for simplicity our idol. How are we going to comment meaningfully and profitably on the hideous complexity through which we are now living? Three bullet points won’t cover Brexit nor explain the reasons for and against it. One side of a sheet of paper may not cover the reasons for our changing culture. A few photographs will not explain the balance of power between the West, China and Russia. The job of the commentator is made doubly difficult by the fact that everyday folk have lost interest in complexity. Today we have Twitter and Instagram – but think of the walls of text in a Victorian newspaper. Today we want to see things reduced to three bullet points, the sound bite, the black and white. We want to see the spectacle of wrong and right, of bread and circuses. Who needs a judge and jury when you’ve got Facebook? We took the sleeper from Euston, for a long weekend in the Highlands. As well as some hillwalking, there was a serious task at hand; the scattering of some ashes of a young woman who earlier this year, had taken her own life. Our journey north was enlivened by about four fingers each of Glenlivet. We arrived at Glasgow Central after an adequate nights sleep, perhaps disturbed in my case by some rather odd whisky dreams. After a quick breakfast in the Gordon Street Cafe next to the station, we nipped off through the chill city streets to get our rental car. By 10 a.m we were parking up at Inveruglas on Loch Lomondside, in light rain. Past the rather impressive hydro-electric power station, you go under the West Highland Line, turn uphill keeping some rapids in a gorge on the left, and up a private road into the brown valley. Up ahead, there is a black industrial-looking dam. Power lines march off into the distance. Dodging some maternal cattle who were monopolising the road, we broke right straight up into the hills, a long slog. We stopped for a quick bite to eat in a draughty cleft in the rocks, and pushed on to the summit. As we did so, the weather broke with a vengeance. Another half an hour later in starting, and we’d have been forced to turn back from the summit. In a howling, lashing storm, we bagged the summit and retreated as fast as possible. Fortunately there’s a clear path, even in thick clag. We were off the hill before 2pm, meaning that we’d bagged a Munro in less than four hours. Rather pleased with ourselves, we got in the car and drove north to the Clachaig. Around 10.30a.m, a party of eight of us set off up the Lairig Gartain. On the walk up the glen we had twice to ford streams that were running quite full and needed crossing with care. This was the largest group of people I’ve been on the hill with for twenty years. Six of the people present were university students less than half my age, and a handful of those young people were experienced hillwalkers. Everyone was quite fit, but the collective pace of such a group is slower than that of a smaller party. The route lay zig-zag up into Coire Altrium, negotiating through a band of cliffs and broken ground up onto the col between Stob Coire Altrium and Stob na Doire. We did not reach the ridge until after noon, and we paused there for refreshment. The day was wide open; whilst it was cold and windy, the weather seemed to be clearing. The delicate light and remarkable visibility improved as the afternoon wore on. Along the ridge, things seemed further away than they really were. We met two parties as we continued north-west. The first was two guys, one of them with a rope over his shoulders. He reassured us in a strong Italian accent that the summit of Stob Dearg was by no means too far away. The second party was formed of more members of the university hiking club. 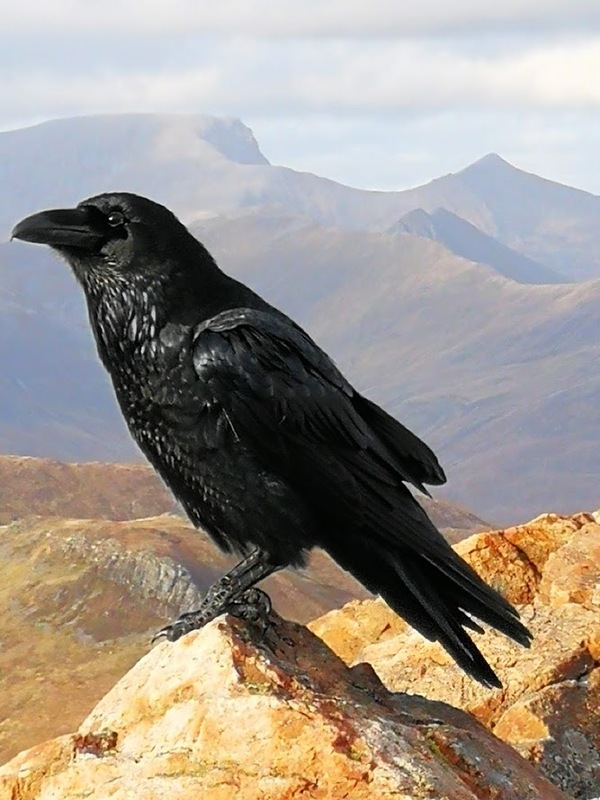 As we moved up towards the main summit of Stob Dearg, we were visited by a very tame raven. Strange, very strange, was this, to my eyes. I only found out later that this bird is a regular denizen of this summit. I should have known my local history better: A mountain with a route up it called Raven’s Gully might well have such birds lurking at the summit. The raven afforded some remarkable wildlife photography, with Ben Nevis prominent thirty miles away in the background. At the summit of Stob Dearg – the shapely triangular mountain commonly referred to as “Buchaille Etive Mor”, the party paused for a moment of reflection. Earlier in the year, someone known and loved by members of the party had taken her own life whilst suffering from depression. Ashes were scattered. It was fitting that such an event should take place on the weekend of Remembrance Sunday. And then onwards and down. First, down to the col, and then, the steep descent into Coire na Tuliach. Until the party went down into the gully, the light remained absolutely remarkable. One might go on the hill for two years and not see conditions like it. Tired now, the party descended to Lagangarbh, and crossed the river. Only as we approached the road on the long tramp back to the car, did we reach for our torches. Our timing was perfect – in more ways than one, for the following day was rainy too. We were lucky enough to do our hike in all too brief weather window as Autumn slowly turned to Winter.